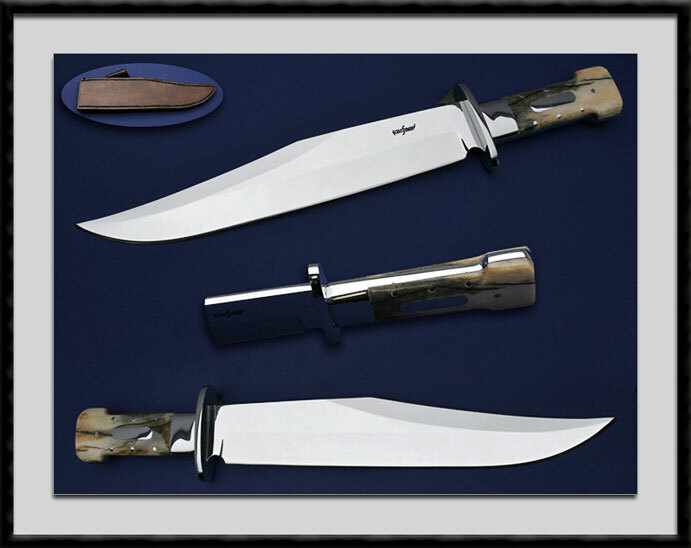 Ed Kalfayan, Knife Makers Guild Member, crafted this "Dog Bone" Battle Bowie, Mirror polished Double Hollow Ground ATS-34 Stainless blade, BL = 12”, OAL = 17 1/4", Clip is not sharpened, Encased full Tang, 416 Stainless fittings, outstanding stabilized Giraffe Bone Scales accented with 7x SS pins and an Escutcheon plate on both sides. Comes with the pictured custom sheath to be worn for a "Cross Draw" application. Fit and Finish are Top Shelf. Condition is New. Ed is no longer taking custom orders and is significantly dropping production.